WSOP.com is the #1 online poker site in the USA. At present, the site is operating in both Nevada and New Jersey under a license to Caesars Interactive Entertainment. Part of the site’s success stems from the brand recognition connected to the World Series of Poker, but the site has been successful at recruiting players thanks to a solid spread of games and timely promotions. New York is currently considering whether to legalize online poker and if a law is pass, don’t be surprised to see CIE make a play at a license. Caesars presently doesn’t operate a casino in the state, but that does not prevent them partnering with another brand or even operating a standalone site if eventual regulations allow. If you are familiar with the 888 Poker client, then you’re familiar with WSOP.com. WSOP is operated on a backbone provided by 888 Holdings and the client is a fairly standard poker client used by the company. Those that like fancy graphics and glitzy products probably won’t like this site, but those wanting a solid client with fast functionality will love WSOP.com. The simple setup is extremely user-friendly with all controls needed to play readily available. • Texas Hold’em – Limit ranging from .01/.02 to $10/$20. No-Limit, Fixed Limit and Pot-Limit all available. • Seven Card Stud – Stud and Stud Hi-Lo are available in Fixed Limit only and spread from .02/.04 to $5/$10. WSOP.com is the nation’s leader in online poker tournaments. Sit & Go’s are run around the clock with buy-ins from $1 to $200. 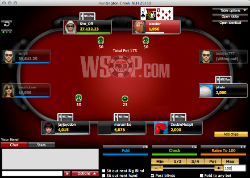 Multi-table tournament players will find the best spread of NL Hold’em tournaments on WSOP.com. They regularly offer solid guarantees on their tournaments, including nightly $10,000 guarantee and a weekly $25,000 guarantee. If there is one drawback to WSOP.com, it is that their tournament offerings are almost exclusively Texas Hold’em. More events in Omaha and adding Stud tournaments would definitely improve the variety. WSOP.com has regularly offered great promotions for their site and you can expect much of the same for when they come to New York. Their welcome bonus will likely give $10 in free play to new players. When players are ready to deposit, WSOP.com regularly offers deposit bonuses with matches up to 100%. Their $100 Daily Welcome Freerolls are also great way for players to start or rebuild their bankrolls. WSOP.com also offers various promotional tournaments throughout the year, most with reasonable buy-ins and solid guarantees. For more on WSOP.com’s promotions, visit their website. WSOP.com has become the #1 legal online poker room in the United States thanks to great promotions and a solid spread of games that appeal to most online poker players. When they come to New York, you can expect much of the same. Odds are that they will become the top site in New York as well.